Gaura Purnima festival is observed on the full moon day in the month of Phalgun (February – March). Gaura Purnima Festival 2019 date is March 21. 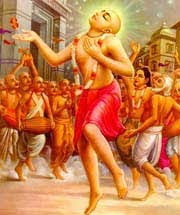 The divine appearance of Sri Chaitanya Mahaprabhu happened on the day. The day is of great significance for ISKCON devotees and a major festival is held on the day at Mayapur. There will be also live online webcasting of Gaura Purnima Festival. Sri Chaitanya Mahaprabhu, also known as Lord Chaitanya, made his appearance in A.D. 1486 in West Bengal, India, and worked tirelessly to show to the world the love of Krishna and his teachings. He spent His life spreading the teachings of the Srimad Bhagavat Purana promoting the spiritual practice of chanting Krishna’s holy names. Extremely influential, He won the hearts and minds of the people of His day.